As it can be obvious by now given my posting frequency, writing is not something that comes easy to me, especially not in English, so this will definitely be a surprising post. In August, a couple of friends and I published a book about the Robot Operating System (ROS), a robotics framework which we’ve been using for a long time and which made the basis for the AVORA AUV software stack. 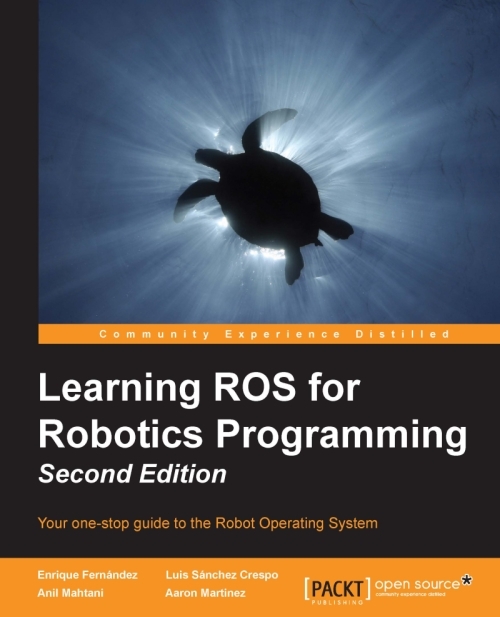 This is the second edition of the original Learning ROS for Robotics Programming, which was written by two of the same authors and also reviewed by one of the authors of the second edition. Unfortunately, as life would have it, I couldn’t be involved with the first edition, so I couldn’t pass on the opportunity to participate in this iteration. Chapter 1 – Getting Started with ROS Hydro: as the name suggests, this first chapter goes through the installation process of ROS Hydro on Ubuntu, covering also the process of doing so in a VirtualBox virtual machine as well as on a Beaglebone Black. Chapter 2 – ROS Architecture and Concepts: the second chapter covers most of the bits and pieces ROS is made of, including practical examples in which the user will learn how to create nodes and packages that interact with each other, as well as with the famous turtlesim. Chapter 3 – Visualization and Debug Tools: there are many situations in software development where we have to deal with the unexpected, this chapter provides information as to how to use common debugging tools, as well as other tools provided by ROS, in order to debug and visualize our nodes, the data and the interactions between the different elements in our system. Chapter 4 – Using Sensors and Actuators with ROS: a very important part of robotics is dealing with hardware, this chapter covers the usage of common and cheap sensors and actuators supported by ROS, as well as some others more complex, and not as cheap, such as the Kinect or laser rangefinders. Finally, this chapter will also cover how to use an Arduino with ROS to expand our hardware possibilities even further. Chapter 5 – Computer Vision: from connecting a USB or FireWire camera and publishing images to performing visual odometry with stereo cameras or RGBD sensors, passing through the image pipeline to perform corrections and transformations to our images, this chapter provides an overview of the computer vision tools provided by ROS and OpenCV. Chapter 6 – Point Clouds: this chapter explores a different approach to 3D sensor data communication and processing by using the Point Cloud Library (PCL), which is a library tailored to 3D data (or point clouds) processing and it’s well integrated with the latest versions of ROS, providing message abstractions and other facilities. Chapter 7 – 3D Modelling and Simulation: in many situations, working in robotics requires working without the robots themselves and in some others the amount of tests required to validate a system make it an impossibility to use the robot for that purpose, in those situations the best bet of the roboticist are simulations with accurate 3D models. Since simulations are an indispensable tool for any serious robotics project, this chapter covers the process from creating an accurate 3D model of our robot to simulating it and its environment with Gazebo. Chapter 8 – The Navigation Stack – Robot Setups: this chapter introduces the navigation stack, which is an incredibly powerful set of tools provided by ROS to combine sensor and actuator information to navigate a robot through the world. This introduction goes through the basics of the navigation stack, explains how to understand and create our own transformations and covers odometry with the use of a laser rangefinder or Gazebo. Chapter 9 – The Navigation Stack – Beyond Setups: as a continuation to the previous chapter and using all the concepts explained throughout the book, this chapter finalises the configuration of our robot to make full use of the navigation stack. Chapter 10 – Manipulation with MoveIt! : the final chapter of the book covers the integration between ROS and MoveIt! which provides a set tools to control robotic arms in order to perform manipulation tasks such as grasping, picking and placing, or simple motion planning with inverse kinematics. The authors of the book, which I consider amongst my best friends and most trusted colleagues, are Enrique Fernández, Ph.D. in Computer Engineering by the University of Las Palmas de Gran Canaria and currently working as a Senior Autonomy Engineer at Clearpath Robotics, Aaron Martínez, M.Sc. in Computer Engineering and co-founder of Subsea Mechatronics, Luis Sánchez, M.Sc. in Electronics and Telecommunications and also co-founder of Subsea Mechatronics, and of course yours truly, M.Sc. in Computer Science and Currently a Software Engineer at Dell SecureWorks (I know, unrelated to robotics). I know, I know, you’re an impatient bunch, right after this paragraph I’ve included a non-exhaustive list of places where the book is currently sold. If you’re not too sure yet, remember that Christmas is very close and books are always a great gift for friends and family, and who doesn’t want to have a grandma who programs robots* as a hobby instead of knitting? We’d like to hear your opinions, so don’t forget to comment if you’ve already read the book or even if you haven’t, and spread the word! * The authors do not claim this book can teach your grandma to program robots.